Amtrak train themed party supplies. Add excitement & fun to your train party with our Amtrak Train party theme. 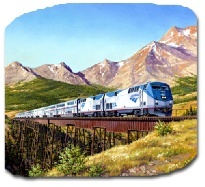 Amtrak Train is here to take you on an adventurous ride. “All Aboard” for the Amtrak party theme of a train you can ride anytime. The must have party theme for any Amtrak fan. Don't forget to check out our Train Cake Pans & Decor section for train cakes, cookie cutters, cupcake topper, etc. and huge selection of popular train party favors, toys and gifts section.